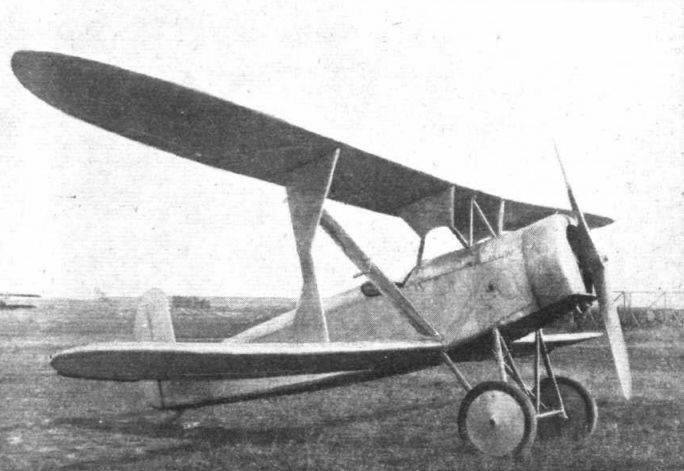 IN our issue of February 14, 1924, we published an illustrated description of the first aeroplane to be built by the Hungarian firm of Feigl and Rotter, of Budapest, a ДальшеMore>>> four-seater monoplane with rotary engine, and known as the "Feiro I." This firm has now produced another machine to the design of Herr Ludwig Rotter, this time a biplane, which is shown in the accompanying illustrations. The objects aimed at in the design of the new Feiro machine "Dongo" (the name, we believe, means gadfly) were : best possible view, safety, and aerodynamic efficiency. The latter resulted in the adoption of wings of large span and very narrow chord, and one might be forgiven for describing the Feiro "Dongo" biplane structure as aspect ratio gone mad, that of the upper plane being no less than 16-9 (span 11-5 metres and mean chord 0-68 m.). However, aerodynamic efficiency was not the only object of this arrangement, as it has served to give, in addition, a particularly good view and, it is claimed, a great amount of stability owing to the small travel of the centre of pressure on a chord of about 2 ft. 3 in. That very considerable structural problems had to be solved before such a biplane structure became a practical possibility may be taken for granted, but the designers are confident that they have solved these problems, and that no trouble need be feared from twisting wings. Unfortunately, very little information is available concerning the details of the wing structure, beyond the fact that three-ply construction has been extensively employed. The plan view of the general arrangement drawings gives some idea of the spar positions, which are placed unusually close to leading and trailing edges, but otherwise detail information is lacking. That the "Dongo" is of more than usual aerodynamic efficiency is apparent from the vector curve published herewith. The coefficients given, it should be pointed out, are our "absolute" coefficients multiplied by 20. The maximum lift coefficient is approximately 0-68 abs., and the maximum L/D, which occurs at a negative angle of about half a degree, is in the neighbourhood of 15. For a machine with orthodox undercarriage, and with biplane cellule at that, this figure can only be described as exceptionally good, the more so as the two seats are arranged side by side in order to make the machine more "sociable" for touring and especially suitable for school work. As already mentioned, in designing the "Dongo," Herr Rotter desired to afford the occupants a good view, and at the same time he wanted to keep the machine as efficient as possible so as to get a good performance with small power output. By choosing a very narrow chord and heavily staggering the planes, he was able to avoid any cut-out in the trailing edge of the top plane, a feature of most "orthodox" biplanes and one which in the opinion of the designer of the "Dongo" is detrimental to efficiency. The pronounced stagger (very nearly equal to the chord) has further been employed to give longitudinal stability by setting the top plane at a positive angle of incidence of 2 degrees and the bottom plane at 0 degree incidence. It is claimed that by this arrangement sudden stalling is avoided. The safety of the occupants is thought to be assured by the strong steel-tube cabane upon which the top centre-section is mounted. Should the machine turn over on the ground, it is thought that this cabane would stand up to any reasonable shock. Incidentally, it might be mentioned that the cabane is provided with means of altering both the angle of incidence and the stagger. The single inter-plane struts are of "K," or rather of "X” formation, the main strut running from bottom front to top rear spar, and the diagonal members of the built-up strut running to rear and front spars respectively. The lift bracing is in the form of a single steel tube on each side, working both in tension and in compression, twisting stresses being taken by the inter-plane struts. Ailerons are provided on the bottom plane only, and are stated to have proved to give ample controllability. 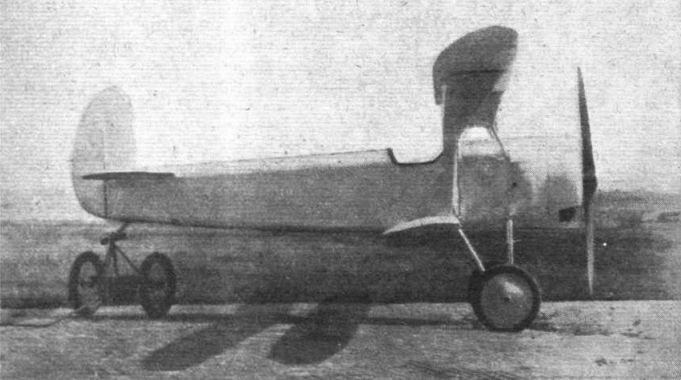 The fuselage is of the fiat-sided type, with rounded top and bottom fairings, and as already mentioned, the occupants sit side by side, so that the fuselage is necessarily somewhat wide (3 ft. 11 in.). Dual controls are provided, the set on one side being readily removable. An engine of 60 h.p. had been contemplated, but as one was not available when the machine was finished a larger engine of the rotary type was installed and was throttled down from 1,250 r.p.m. to 1,050 r.p.m., in order to represent the engine for which the machine was designed. At the reduced revolutions, this engine and airscrew combination was estimated to give exactly the equivalent of the -60 h.p. engine, although the extra weight naturally affected the performance somewhat adversely. The rotary engine is mounted on an all-steel structure in the nose of the machine, and the engine housing is separated from the cockpit by two fireproof bulkheads. The carburettor, oil pump, etc., are placed in the space between these two bulkheads, and as the air intakes are taken outside the cowling, while the space between bulkheads is well ventilated, there should be very small risk of fire. The petrol tank is placed in the deck fairing, aft of the rear fireproof bulkhead and above the cockpit. It gives a sufficient head of petrol to enable direct gravity feed to be employed. The undercarriage is of fairly normal type, but the wheels are placed rather farther forward than normal in order to reduce the risk of nosing over. In spite of this fact, the tail is stated to come up quickly on opening out the engine, owing probably to the effective tail of high aspect ratio. The forward wheel position might be expected to give the machine a tendency to pitch and bounce somewhat, but we understand that no trouble of this sort has been experienced. The Feiro "Dongo" school machine: Three-quarter front view. Note the X-struts. The Feiro "Dongo" school machine: This side view gives a good idea of the pronounced stagger.